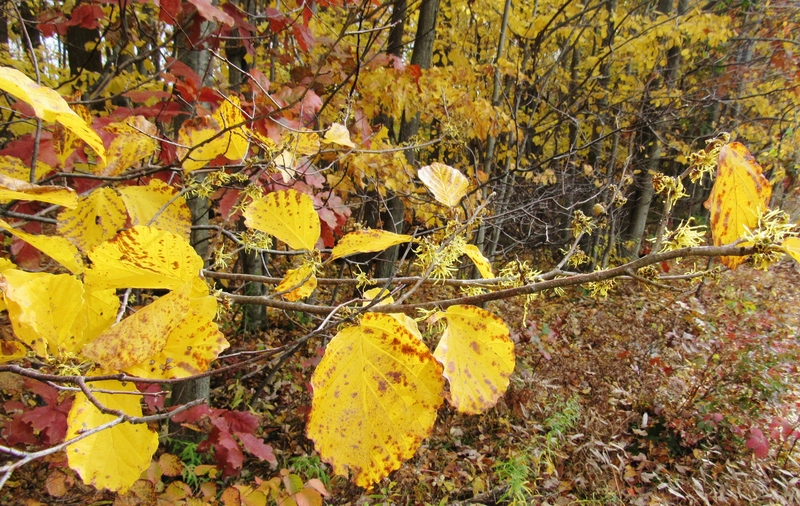 The witch hazel tree is a small, hidden in plain sight, understory tree with gnarly-looking branches. Perhaps one of the strangest and least recognized native trees of Oakland County, it thrives in most parks with rich woodlands. 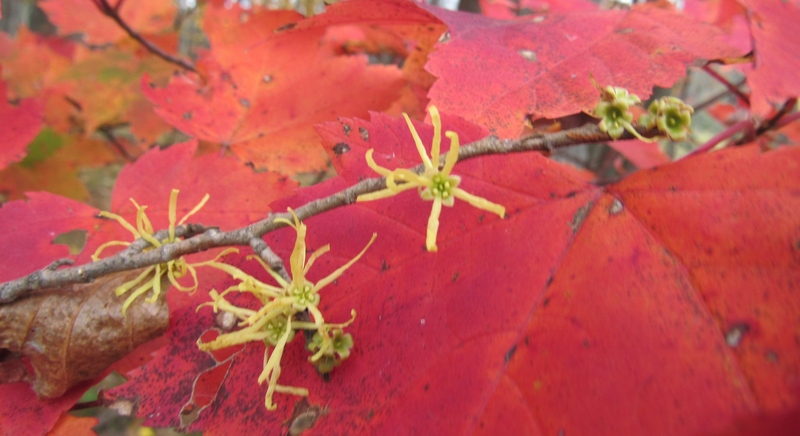 Witch hazel spans the American countryside, from the deep forests of Maine and the Green Mountains of Vermont, to the hills and hidden hollers of the Appalachian Mountains, down into the lowland forests of the South. With Halloween just around the corner, this tree, with a delightful mix of myth, mountain lore and scientific fact, is flowering right on schedule. Unlike most northern plants, that select spring as the season of blooms, the witch hazel (Hamamelis virginiana) waits until the cool, short days of October to produce delicate clusters of spidery, fragrant, yellow flowers. Few, however, notice the flowers, for they are lost in kaleidoscopes of rich colors in the woodlands on the wilder side of Oakland County. But when the strangely beautiful, little blossoms are framed by a dramatic backdrop of red maple leaves in their deep crimson finery, they draw the human eye and make one wonder what the previously unnoticed blooms might be. 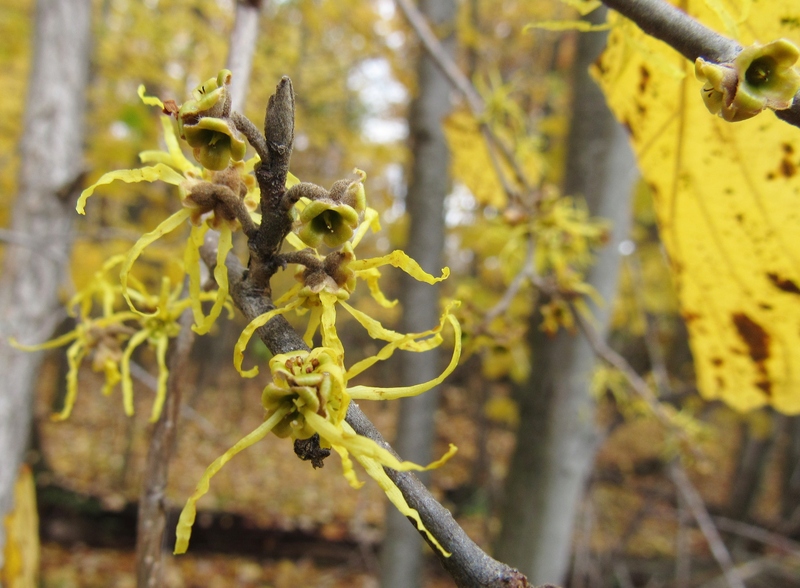 The history of witch hazel is fascinating. Long before it found its way onto drugstore shelves for external uses on skin inflammations and skin-toning astringents, it drew the attention of Native Americans. According to the Medicinal Plants of North America by Jim Meuninck, witch hazel was commonly used medicinally by the Cherokee, Chippewa, Iroquois, Mohegan, Menominee and Potawatomi peoples. A search of ethnobotany literature clearly shows it was a virtual pharmacy for Native Americans and then the Europeans who marched westward. Witch hazel tea was popular for sore throats, colds and coughs. Leaf and twig poultices were used externally to treat wounds, minor burns, insect bites and skin irritations. According to the United States Forest Service, Wicke is the Middle English word for ‘lively’ and ‘wych’ is from the Anglo-Saxon word for ‘bend’. American witch hazel was probably called Wicke Hazel by early settlers because the dowsing end of the forked branch would bend when underground water was detected by the dowser. This practice had a widespread use by American settlers and was exported back to Europe. Dowsing became an established feature of well-digging into the 20th century. 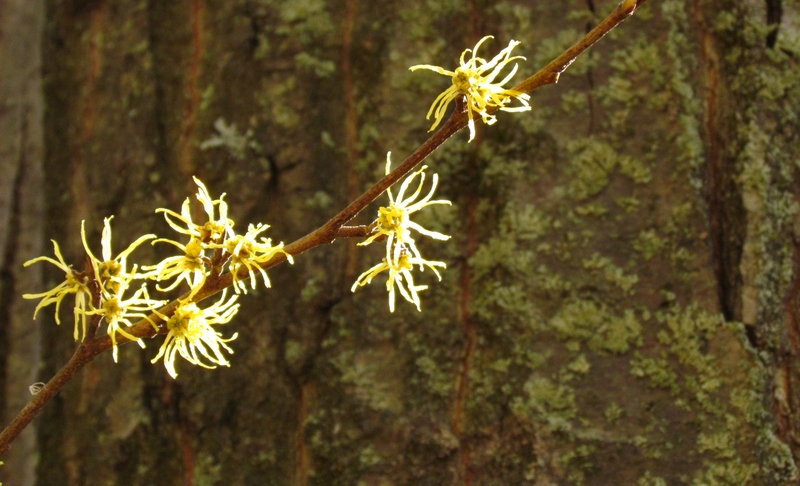 One use that draws special attention is the witch hazel’s witching abilities. Folklore claims that if a person scouts an area with a properly-cut, properly-held, Y-shaped witch hazel limb, it will bend toward the ground and point at hidden springs and other water sources. I discovered the dowsing rods of witch hazel back in my early nature-hungry college days in the hills of Plainfield, Vermont. I tried it. It did not work. Perhaps I did not properly cut or hold the Y-shaped limb. Or perhaps witch hazel’s preference for growing in damp woods and along stream corridors led early settlers to believe that the plant could lead them to elusive underground springs. Regardless of the mix of fact and fantasy, the flowers were so beautiful that I was smitten by witch hazel in those early days in Vermont and am still drawn to witch hazel flowers and something else — the exploding seeds. A silent walk in the woods on windless and dry, late autumn days may introduce the observant hiker to the plant’s explosive means of seed dispersal. 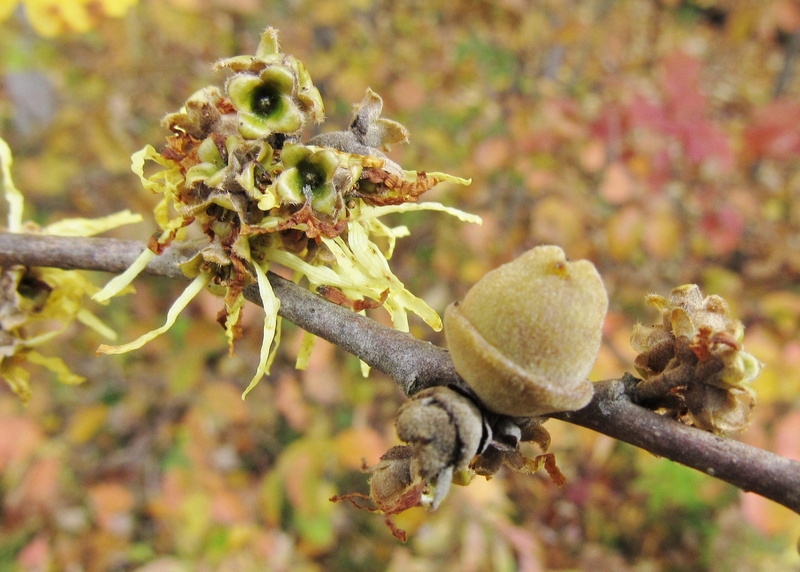 Requiring a full year to mature, a pair of witch hazel seeds can be found within each woody capsule that ripens among the delicate blossoms. Witch hazel trees often grow in clusters and if you time it just right, and the forest floor is covered with dry leaves, you can hear the clattering of the landing seeds as the capsules burst open with surprising force. Some of the seeds will travel more than 20 feet in a burst of botanical energy. Even after killing frost has wiped out more sensitive plants, the witch hazel continues to flower. It’s an interesting, if not odd, strategy for any plant that needs insects as pollinators. But with few other flowers blooming and competing for insects, except for perhaps for some asters, the slightly lemony scent of the blooms attract both late season flies and moths to the brilliant yellow, spider- like petals. Generations of Americans have collected, cut, gathered, pressed, boiled and steamed this beautiful forest tree into human service and some uses of the plant hold a stamp of approval from the Food and Drug Administration — and it gets the nod from witches at the dawn of Halloween for its alleged water witching ability. Regardless of the fine line between fact and fantasy, there is no better time than now to walk the woodland trails of Oakland County Parks in search of the spidery-yellow blossoms of this hidden beauty with a fascinating natural and human history. 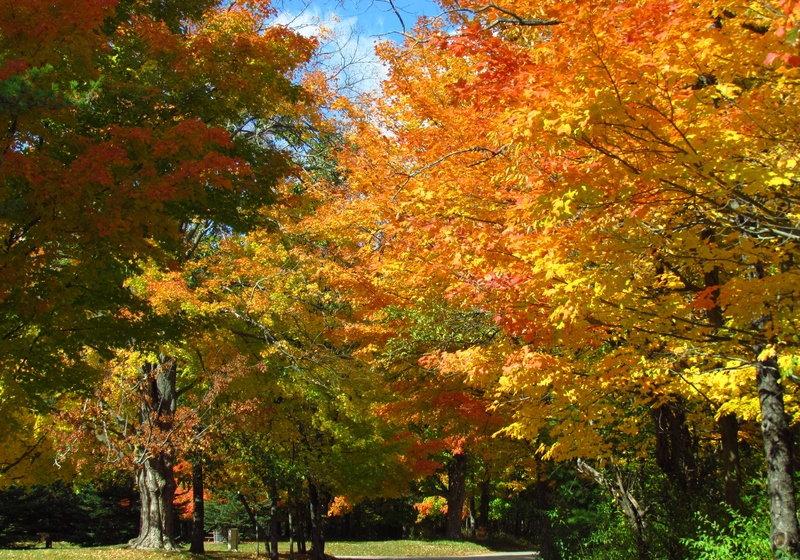 Visit DestinationOakland for information on all 13 Oakland County Parks. Discovering Addison Oaks County Park – on Horseback!